The most prominent sign of strabismus is the misalignment of eyes, which can lead to amblyopia and vision problems. Small angle strabismus (an eye turn that isn't cosmetically noticeable) often leads to eye strain and headaches. 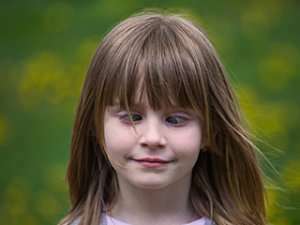 In addition, strabismus often causes young sufferers significant emotional stress, as it affects the ability to make normal eye contact with others. Eye care professionals diagnose strabismus using a series of tests: visual acuity, refraction, alignment and focusing, and an examination of eye health. Once strabismus is diagnosed, it can be treated according to its cause and severity. A case of accommodative esotropia can be corrected with glasses, but more serious cases of strabismus might require muscle surgery and/or vision therapy.